I enjoy fishing. Trout fishing is fun but it is nothing compared to the battle one wages trying to wrestle a 20 lb Chinook salmon to shore or onto a boat. The excitement of getting that tug on your line, you set your hook and then the fight begins as you and the fish each take turns tugging on the line in an attempt to wear the other out. Eventually the fish tires and you bring it aboard the boat. It is beautiful and majestic. And as you examine it you spy that adipose fin just forward of the tail. It is such a lovely fish and would taste fantastic for dinner but you put it back in the water and wish it the best of luck as it continues it’s journey up river. This is a scenario that plays out all the time up and down the Columbia river and its tributaries. We here in Oregon, Washington, and Idaho love our salmon. Most of us don’t even think twice about throwing a wild born fish back into the river. We want them to do well and increase their population so that one day they might run up rivers in as great of numbers as they did 200 years ago. 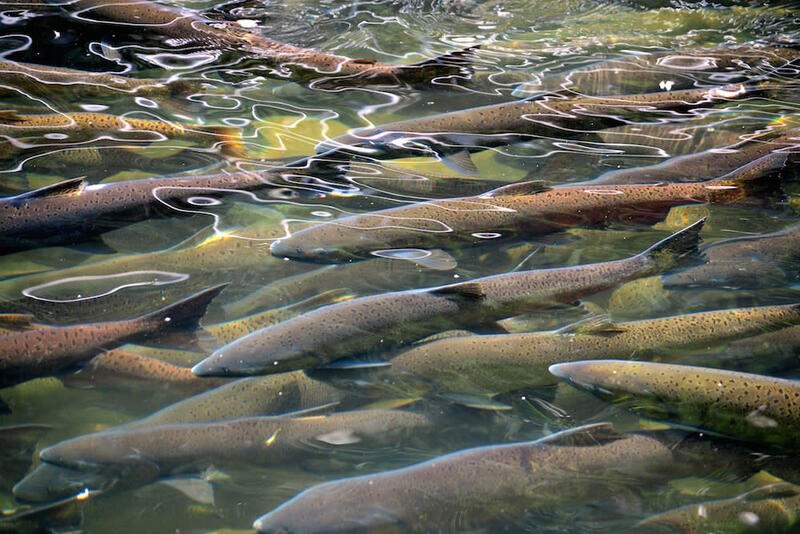 All the salmon species that run up the Columbia are currently covered under the Endangered Species Act due to heavy declines in their populations. This decline is a result of human expansion here in the North West. Over-fishing, dams, pesticides, and destruction of habitat are some of the big causes of these fish dying out. But once the salmon problem was realized and huge effort has been made to rejuvenate the salmon population. We have built lots of hatcheries and protected areas and continue to increase both of these every year. Though by no means perfect, there are ladders and other systems in place to try to allow safe passage for salmon when they navigate through the dams as their life cycle takes them up and down the rivers. There are very strict limits on how many wild salmon may be kept per year. Most of what is caught and kept is hatchery born fish so that we don’t impact the wild salmon runs in a detrimental way. 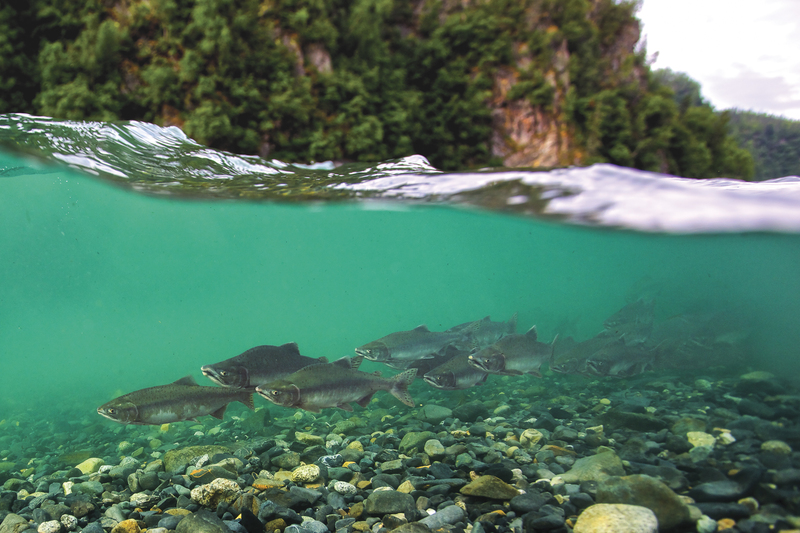 In fact since the early 2000s overall salmon population has been on the rise. But in recent years the salmon have been facing an ever increasing danger caused by predation from sea lions that have made their way up river. In the 90s there were only a couple dozen sea lions that would make their way up the rivers but now 500-1400 sea lions inhabit the Columbia and Willamette rivers depending on the time of year. This is not part of their traditional habitat and as such are considered an invasive species. They often hang out by the fish ladders at Willamette Falls and Bonneville because the fish stack up here in order to get up river. They have also got into the habit of taking salmon that are being reeled in by people fishing. If you are anywhere on the Willamette during fishing season you will often hear curses being slung at the sea lions stalking the fishing boats. The sea lions moving up the rivers have been having a big effect on the salmon runs. Though annoying, the sea lions taking hatchery fish isn’t the end of the world. But because they do not discriminate between wild born and hatchery fish they do hurt the wild salmon moving up river. Attempts to capture and relocate the sea lions have proven ineffective. Sea lions that have been capture and tagged at Willamette Falls then relocated to New Port appeared back at the falls 3-6 days later (over 200 mile swim). Noise deterrents and rubber bullets are often used by wildlife workers in an attempt to chase the sea lions away, but these have little to no effect. Citizens and DFW employees have been asking for the ability to use lethal force more liberally against sea lions in order to safe guard the wild salmon runs. Unfortunately sea lions are federally protected under the Marine Mammal Protection Act of 1972. During the 60s and 70s the sea lion population had dropped below 30,000 but now the sea lion population is at a whopping 300,000 and well out of the danger zone. Bipartisan proposals involving Washington, Oregon, Idaho, as well as the Columbia River Inter-Tribal Fish Commission have made their way to Congress and are in the process of being approved. HR-2083 was voted in by the House of Representatives in June. The Senate is currently working on S-3119 (Endangered Salmon Protection Act) which will work in tandem with HR-2083. These bills will streamline and expand the current processes for the removal of sea lions within the Columbia river basin. They will also allow the north west states and local tribes to issue permits to wildlife employees to eliminate up to 920 sea lions per year for the next 5 years. While most locals are in agreement over this new legislation there are some throughout the country that think the new bills are heavy handed and will not solve the problem. Naomi Rose of the Animal Welfare Institute in D.C. Thinks that killing sea lions will have no lasting effect on the salmon runs. “Get rid of the dams, get rid of the fish ladders, and you will solve the problem,” Rose said. “This is a bad bill … these sea lions are going to die for nothing.” I would agree with her that without the dams the fish would have a much better chance of traveling the rivers safely. Without the bottle necking at the ladders there would be less easy meals for the sea lions and they would leave. But we are a technological society and require lots of electrical power and hydro is one of our best ways to reduce our carbon footprint. At this point removing the dams along the Columbia would probable be more detrimental to the environment than helpful. So as we can see there is no easy answer to this one. Everyone would love to avoid killing sea lions but unfortunately it seems to be the best option out of a list of not so great options. Hopefully, once the sea lions start seeing some of their buddies being hunted, they will decide that the free buffet is over and go back to the ocean. I think we can all agree that it would be best for the salmon if the sea lions stayed to their natural habitat.